our entire team is comprised of scientists and practitioners that are actively immersed in research. we take research & innovation seriously. Dr. Nicolaas Bouwes has been an Adjunct Professor of Fish Ecology in WATS since 2000 & is the owner and founder of Eco Logical Research, Inc..
Dr. Stephen Bennett has been an Adjunct Professor of Aquatic Ecology since 2014. We use our own custom design apps to document our field designs and as a platform for collecting monitoring data. 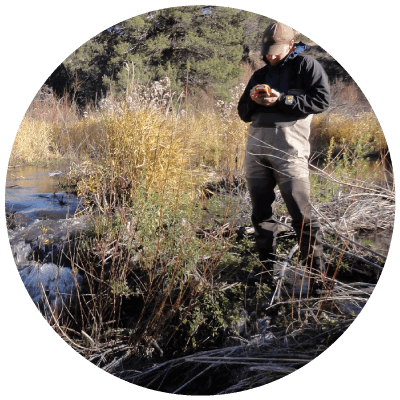 Anabranch Solutions was born out of collaborations between Nick, Joe and Steve on experimental restoration projects and techniques and the science and monitoring to test those techniques. 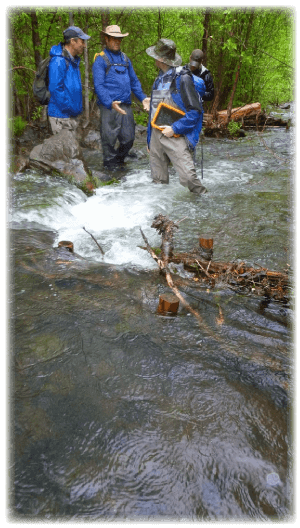 As interest in the techniques from managers and practitioners grew, we developed Anabranch to help those seeking to apply these alternative solutions to their own watersheds. To truly address the scope of degradation of riverscapes, we need to apply and kickstart restoration processes that can actually operate at the spatial extent of degradation and they need to kickstart fluvial & ecological processes that will be self-sustaining. We started Anabranch, in part, to test this hypothesis, by putting our ideas to the test and actually implementing large scale restoration and partnering with others to scale up the implementation and see if we can help recover and restore whole systems. Instead of just doing boutique restoration and small-scale experiments, we are actively tackling restoration at the watershed scale. When you hire Anabranch, you not only draw on the scientific expertise of our staff, you are also investing in further science. We charge competitive hourly rates for our staff time, but built into our overhead structure is a strategic investment in continued research and development. Each year we invest in monitoring, analyses and dissemination of our findings through peer-reviewed publications and outreach. We build our own custom field apps for monitoring and design.